Kate Nyx with a mask she created for her husband, Ophidian the Cobra, a Chikara wrestler. Her work will get main-event treatment this weekend at the Chikara tournament. The culmination of the year in professional wrestling builds this weekend as the WWE presents its 32nd annual WrestleMania, the equivalent of the Super Bowl for scripted gladiatorial combat. Sometime during Sunday's event, take a moment to tune out the spectacle, the muscled behemoths hurling their bodies around the ring, the over-the-top characters playing out their story lines in steel cages and atop precarious ladders, and give a thought to the wardrobe that has to withstand choreographed violence. Kate Nyx (a.k.a. Nickerson) understands what it takes to costume a pro wrestler. Two years ago, she started Closet Champion (www.closetchampion.com), designing and creating custom wrestling gear out of her South Philadelphia home. 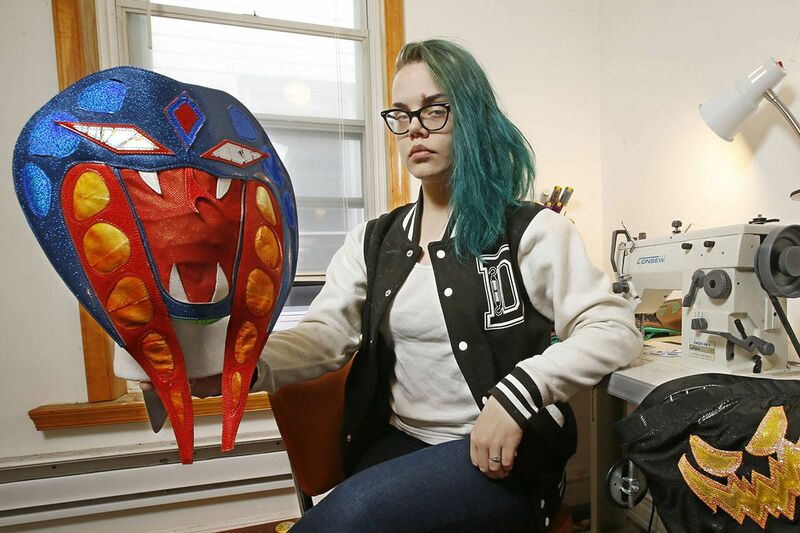 A large portion of her income comes from Chikara, a Philadelphia independent wrestling promotion, in its 16th season, that draws equal inspiration from lucha libre and comic books. Eight months after leaving her day job selling hosiery at a luxury boutique in Center City to focus on the new endeavor, she's tenuously returning to her sewing machines after a bout of tendinitis and nerve pain due to the challenging materials she works with. "I just don't think my body was prepared for the volume of work that I was doing," Nyx said last week amid a clutter of glittering fabric scraps. "Stretch materials are notoriously hard to work with, and everything I use is basically vinyl, spandex, and elastic. It has to look like a larger-than-life costume, but it has to go through what activewear would go through. Exercising creativity within those limitations has been interesting and sometimes frustrating." There won't be any Closet Champion designs on display when WrestleMania unfolds Sunday at the AT&T Stadium in Arlington, Texas. The closest Nyx has come to that big a stage is through NXT, the WWE developmental program that is spotlighted in its own weekly show on the WWE Network (and that tonight will present its own big show, Takeover: Dallas). Nyx designed the gear for a wrestler named Sarah Dobson (known on the independent circuit as Crazy Mary Dobson), who made her NXT debut last week. Nyx has, however, created gear for other nationally televised promotions, including Total Nonstop Action wrestler Mandrews and former TNA Knockouts champion Jessicka Havok, as well as a number of Ring of Honor wrestlers such as the flamboyant Dalton Castle. Her costumes get the main-event treatment Saturday when Chikara hosts a pair of shows comprising the eight-team Tag World Grand Prix tournament at its Northeast Philadelphia home base and school, the Wrestle Factory. Unlike the growling gargantuans from WWE, Chikara shows are family-friendly, high-flying, and unafraid to be goofy. It's the kind of show where one tag team with crustacean masks might battle another that boasts ice-cream-cone heads, or where a whole stable of ant-themed wrestlers (Worker, Fire, Soldier) known as the Colony march to the ring to the tune of (what else?) the Dave Matthews Band's "Ants Marching." Several of the wrestlers at the show will be sporting Nyx's designs, including former Chikara grand champion Icarus. As in lucha libre, Chikara wrestlers are adamant about keeping their actual identities secret. "I work with Kate because she's local, makes quality gear, and tolerates my madness," Icarus said via email. "She works well with my creative ideas and understands the need for quality material and stitching that will hold up to professional wrestling." Nyx, 25, was introduced to the pro-wrestling world by her husband, a longtime Chikara wrestler known as Ophidian the Cobra, who wears a snake mask. The two met in 2008 when both were part of a combination circus, burlesque, and pro-wrestling show in Detroit, where Nyx was living. "I remember being like, 'Holy crap - that's what wrestling is?' " Nyx recalls. "I thought wrestling was garbage. I thought wrestling was 'Stone Cold' Steve Austin and yelling and anger, and I just watched a snake-person hypnotize someone and backflip over another dude. I would watch that!" While wrestling gear is a relatively recent undertaking, making costumes has been a near-lifelong pursuit for Nyx. Her mother worked as a costumer at Lancaster's American Music Theatre, and the materials that littered their Newark, Del., home entranced Nyx. "My mom says I was born with a needle in my hand," Nyx says. By the age of 13, she was working as an assistant to her mother in Lancaster, and a few years later became an assistant costumer for the Pennsylvania Renaissance Faire. That job was closer to her own interests than the one that has taken over her life - while she has learned to love some aspects of wrestling, Nyx has a passion for the Mythic Arts community, which includes the Pennsylvania Ren Faire (Saturdays and Sundays, Aug. 6 to Oct. 30, 2775 Lebanon Rd., Manheim, Pa., www.parenfaire.com) and the Spoutwood Farm Fairie Festival (April 29 to May 1, 4255 Pierceville Rd., Glen Rock, Pa., www.spoutwood.org). She has been involved for more than 15 years. Right now, she's creating outlandish outfits for Chikara talents like ThunderFrog, Hallowicked, and the current grand champion, Princess KimberLee, whom Nyx calls "a dream to work with. All she said was, 'I want it to be royal blue,' so I was like, 'Sweet, I'm going to make you some awesome lady wrestling gear that's going to make you look like Sailor Moon and Snow White.' "
Having recently taken on an intern and looking for an employee willing to work with her challenging materials, Nyx is cautiously optimistic about overcoming her recent injury and continuing to evolve her business. With a foot in the door of the world's largest wrestling promotion, she hopes to make a significant impact. "I've already seen gear in upper-level companies that are copies of things that I've made, which is sort of awful, but also kind of great because you see the way that the independents are informing larger companies," she says. "I would love to make more gear for NXT, but especially for the NXT Divas. Women's wrestling gear is notoriously awful - it's primarily a bikini and maybe gloves. I love making gear for women, and I think that there's a lot of potential for creativity there." 4711 Wingate St. $20. www.chikarapro.com.